IT IS THROWBACK TIME AGAIN! How are you all doing this week? How was your weekend! Mine was so relaxed and full of reading, even though I was on call it was awesome! AND! AND! 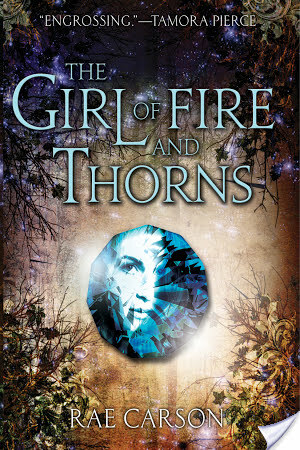 I ended up reading chapters 12-23 of The Girl Of Fire And Thorns by Rae Carson this weekend, and also early Monday morning — I woke up at 5:50 to read the last chapter and type this post up before work. Now that is what we call DEDICATION. So, okay, this section begins with a kidnapping! Elisa is fresh off the high of Alejandro visiting her room that night – not for sexytimes but for intrigue type things. Elisa smells this cinnamon smell, wakes up someplace that is not her bed and realizes that she has been kidnapped by Cosme and four other desert people. YOU GUYS! Cosme! She is such a great character and I love that we get to know her much better in this section and we get to see how truly kickass she is. So, okay this is the part where Elisa makes the journey to the secret village in the desert. She does lose weight during this section because of the journey — and actually part of why this section took me so long to read is because I got distracted by Carson’s essay in the back on this very thing – Elisa’s weight loss. And how we judge women for their bodies no matter how they look – whether they are thin or fat – and it is an awful thing. Anyways, this part is where we see Elisa continue to change and to survive and grow stronger. THIS IS ALSO THE PART WHERE WE MEET HUMBERTO and the first ship begins. Obviously there is a thing that happens and a different direction for the love, but still, aw. This plays into that whole Stockholm Syndrome trope, but it is more than that. Aside from helping to kidnap her, Humberto always treats Elisa kindly and even makes sure she gets extra water at one point. It’s really sweet. Also, he is Cosme’s brother. AND YOU GUYS THERE IS A KISS! YAY KISSING SCENES! Probably my favorite scene of the book takes place here and you guys – check your surprise, it is not a kissing scene! It is the part where Elisa rallies the desert people. She forms the Malficio. It is literally the greatest and she recognizes that everyone has a talent and a part to play when it comes to defeating the Invierne. I LOVE THIS. I love that there’s so many little ways for them to strike out. They are about to wage a guerilla war and it is the greatest. Finally, this part ends with some spying on the Invierno and also learning a huge secret about godstones and a traitor in the midst. DUN DUN DUN! The Carson books reminded me a lot of Tamora Pierce’s Alanna books, which I adored. Those are really a throwback… the first one came out in the 80s, but the series went on for a long time.